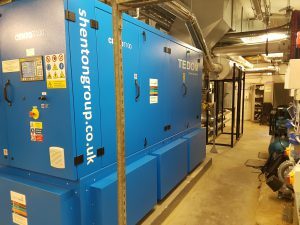 Having been at the forefront of Combined Heat & Power for some years, shentongroup strives to improve the quality of the UK’s CHP sector. One such way of achieving this is through the government’s Combined Heat & Power Quality Assurance Programme; a program that we advise many of our clients to participate in. The overall goals of the CHPQA scheme are to monitor, assess and improve the quality of UK Combined Heat and Power. Although the CHPQA scheme is voluntary, participation demonstrates that an organisation supports the environmental and the economic and social benefits that CHP brings with it. CHPQA certification also shows that an organisation can support any claims relating to them offering Good Quality CHP and they can utilise CHPQA certification to claim Climate Change Levy (CCL) exemption on fuel inputs to, and power outputs from, in conjunction with a Secretary of State (combined heat and power) exemption Certificate for their CHP Scheme. In addition, a CHPQA certificate can be used to claim Enhanced Capital Allowances (ECAs) in conjunction with a Secretary of State Certificate of Energy Efficiency (1). The CHPQA programme is managed on behalf of the Department for Business, Energy and Industrial Strategy, in consultation with the Scottish Executive, the National Assembly of Wales, and the Northern Ireland Department of Enterprise, Trade and Investment. To gain CHPQA certification, your first step is to register for the programme by completing form F1 which can be accessed here. On receipt of the form, you’ll be sent a unique reference number, username and password which will enable you to access the electronic submission system. You can then move on to the submission section, a procedure that is dependent on the complexity of the scheme i.e. whether it is ‘simple’ or ‘complex’ (1). CHPQA is an annual certification process and after the end of each calendar year, you’ll be required to compile the CHP scheme energy data monitored throughout the previous year; assess the scheme’s performance; and submit your resultant figures on the appropriate forms for validation to CHPQA (1). To gain a better understanding of the benefits of acquiring a CHPQA certificate and the processes involved, click here to speak to a shentongroup CHP expert now! (1) Combined Heat and Power Quality Assurance Programme 2014, Department for Business, Energy & Industrial Strategy, accessed 03 April 2019, https://www.gov.uk/guidance/combined-heat-power-quality-assurance-programme.